Yesterday afternoon I had the opportunity to accompany Scott Sternbach to Jacob's Island, about 2 miles from station. Jacob's is an amazing rock, so thick with moss and ridges of white granite that I felt I had been transported to the Scottish Moors. 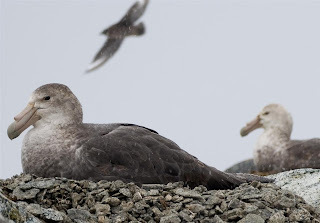 More about the island later, but the visit got me thinking about one of my favorite birds here, the Southern Giant-Petrel. On Jacob's, and on all the islands near here, there are a few birds, paired and sitting on nests. In the air, the 'Giants' are powerful and graceful. Their gorgeous wings look loose and organic, and they easily curl up the ends like an amazing airfoil to maneuver their lazy turns. With their bulky bodies, they are most comfortable flying in a stiff wind or good air, and they are experts at finding that good air. When I'm watching, I almost never see these birds flap their wings. 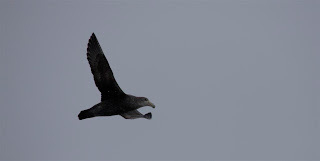 Seemingly, they can soar all day and love to do so, turning figure eights and circles above the islands. The silence, and their size (up to 18 pounds and a wing span span of over six feet) is what one notices most about the bird and it makes every action seem considered: even when flying fast and low, as they often do, the Giants never look like as though they are in a hurry; every feather looks dignified and they have a natural solemnity. On the ground the Macronectes giganteus look pretty goofy. They half-hop from one enormous webbed foot to another; their wings held out like a haphazard balance beam. The combination of that awkward loping gait and their huge heads, constantly turning and craning, make them look like loveable cousins to the Three Stooges. The truth is that the Giants are ruthlessly effective hunters and scavengers. 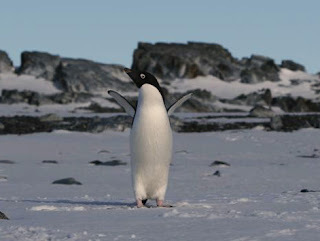 They nest near penguin colonies and elephant seals in order to prey on the young of one and the dead of the other. Their enormously long, curved bills are strengthened to tear into intact carcasses, which they do, in addition to hunting krill, squid and fish. Two factors have contributed most to the declining numbers of the Giant (at least 20% in the last several decades), accidental entanglement in longline fisheries and the decline in elephant seal populations, whose carcasses they depend on. The Giants are variously listed as threatened or endangered on conservation listings. Giants, like most of the animals in the Antarctic are slow growing, reaching maturity at six or seven years. When they pair, it is to raise a single chick in a stone nest on the cliffs of islands like Jacob's. After 60 days of incubation, the youngster is brooded for about four months and then takes to the sea like its parents. This weekend I was glued to the news of wildfires in Southern California. Coming here from Pasadena, I understand how dangerous and destructive these fires are. I'm thinking a lot about the fire fighters on the lines and the families who have evacuated or lost their homes. My thoughts, and the thoughts of everyone here, are with you all in Cali. Visitors of all sorts ! The last 24 hours have been amazing. The helicopter from Endurance did not make it in but we have an amazing set of visitors of other sorts drop by. Fin Whales, Humpbacks and Minke Whales were all spotted yesterday afternoon in the area just off station. These are our first whale sightings of the summer and exciting to everyone. 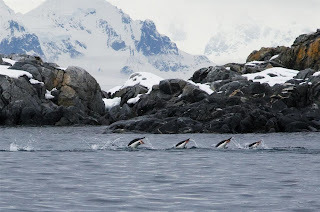 Also last night, we spotted a group of Chinstrap Penguins ashore at Split Rock Island. 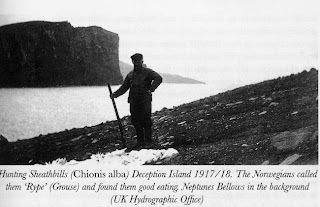 Of the three local penguin species, "Chinnies" are the least common and even the old timers here were excited. And then this morning, unbelievably, a Chinstrap came ashore here during our morning break and while we were watching it, a juvenile Humpback Whale swam right up along the pier, playing for a good long time. Seemingly, they were both here for friendly hello and a look at us, or perhaps, for the fishing off Torgerson Island. Fantastic !! I don't photos of anything yet, just one of the Chinnies on Split Rock. 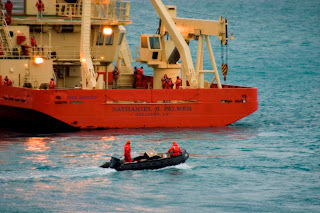 The Endurance vessel is coming in this morning and visiting via zodiacs. More later. 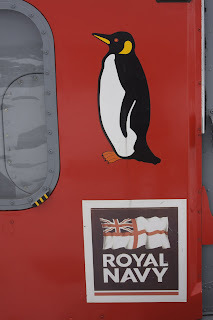 This morning we got a radio call from the British Royal Navy Ship 'Endurance'. They are in the area and would like to "drop in for a small hello" via helicopter. Word is, their galley isn't as good as ours and they would like some fresh baked cookies. I'm unbelievably excited as these will be the first new faces I will have seen in 8 weeks. Our band of 24 people is just fine but newness is exciting, even if its just for a few hours. I'll keep you posted. This weekend was bright and gorgeous with low winds. 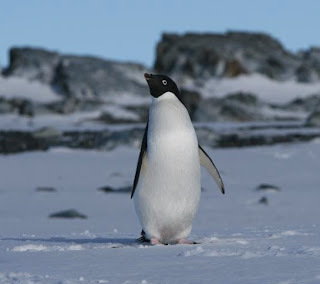 The perfect weather to visit the Adelie colony on Torgerson Island ! 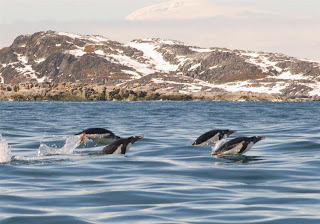 Marine biologists work here at Palmer under the Long Term Ecological Research program to track the populations of penguins and other seabirds. Most of the islands they work on are closed to visitors. We're lucky that Torgie (Torgerson) is a rather big island and half of it is open for visits. Over time, Torgerson is serving as a case study of the impact of human visits on the colony. A large brown Weddell Seal had hauled up and was enjoying the day. She seemingly couldn't get comfortable on the sharp rocks and was in a slightly different place each time I saw her. The colony is a noisy, busy place. All of the birds are concentrated in dense groups now. The few pioneers who had chosen new spots, maybe a bit higher or drier-seeming, that the regular locations have now given those up and joined with the others. All of the birds are standing in couples with one partner on the nest and the other preening or half-heartedly searching for more pebbles. There is lots of squabbling and vocalizing. Minor arguments like this one between neighbors seem to break out every few minutes. A lot of the nests have eggs. Kristen and Jen, the field biologists say its 30% or more. The birds seem to be proud parents, inspecting the eggs carefully when they stand up. Some of the birds seem to be especially proud. This couple inspected their egg and then swayed and brayed at all of their neighbors. It was comical to see all of the other birds staring at them. Of course, I have no idea what they were really thinking but it seemed to be "look at us". Here are just a couple more view of the day. The station is just visible in the background here, look for the blueish buildings. This morning a largish white bird landed outside my window and looked at me quizzically. To my mind she was saying "can I come in ?". The bird was one of our local snowy sheathbills, a species that is by turns amazing and pedestrian, stunningly attractive and even a bit repulsive. Around here we affectionately refer to them as "chickens" or "pigeons" because of the way they hang around the humans like pigeons in a park, but they are actually more closely related to wading birds like plovers. The adults weight 1 or 2 lbs and are about 12" long. 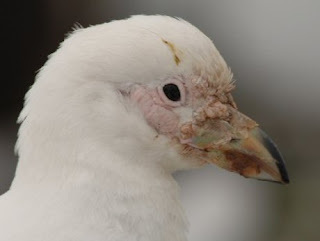 Their beaks are covered in horny sheaths which give them their name. 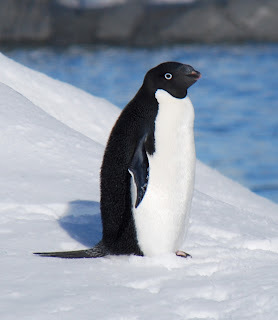 Sheathbills are well adapted for life in the Antarctic environment with their short, stout legs, an insulating coat of dense gray down, and a thick layer of subcutaneous fat. They are fearless around humans, gathering around the buildings on station. They seem to especially like our boats and the hot tub. An oddity is that they almost always prefer to use just one foot, standing or hopping along with just the one. This is confusing to me at first; when I first arrived to station, I thought we had a population of one-legged birds. Master scavengers, sheathbills serve as the clean-up crew of the continent. Because they lack webbed feet, they must find their food on land; in the winter prowling for invertebrates and detridus in the intertidal zones. 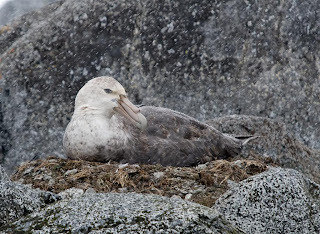 In the long summer months however, Sheathbills move right into colonies of penguins and seals where they time their own nesting to coincide with the birth of young in the colony. 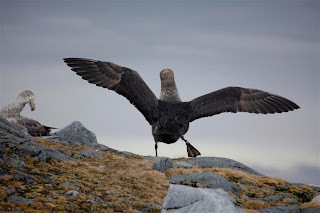 Nest sites are located in small caves and cracks in rocky areas where the parents can protect their young from wind, precipitation and danger from predatory skuas (Stercorariidae). The nests may be abandoned sites from other species and are constructed from feathers, pebbles, bones, shells, lichens, grasses, and seaweed. Once the clutch of one to three eggs is laid in late November or December, the parents gorge themselves on everything organic in the penguin colonys: eggs, placentas, carcasses, sometimes chicks and always lots of excrement. The sheathbills have even perfected a nifty trick called kleptoparasitism in which they steal food right from the mouths of feeding chicks. This is typically accomplished by harassing or jostling the chich before the parent finishes reguritation. Food is dropped on the ground and the result is a happy sheathbill, a hungry chick and a penguin parent who has to go out fishing again. Researchers have shown it is important nutritional strategy for the sheathbill but has little effect on the penguin colony. The days are getting long here. This morning started beautifully at 3:30 when the sun shone in my windows. Resigned to being awake, and somewhat excited by the sunshine, I pulled on warm clothes and went for a walk. At 4:00, the sun lit up the mountains of the continent, to the south of station. Terns and albatross were fishing off the coast. I turned toward the glacier and decided on a leisurely climb up it. The snow from last night formed a fine powdery layer that crunched under my feet and made the walking easy, even without crampons. By 5:00 I reached the top and looked out. The local islands were hardly discernible from the glittering water. The sun was high in the sky now, almost where one would think of at noon. Today will be almost 17 hours long. Standing still, I could hear the sounds of the glacier creaking and groaning as well as elephant seals, off somewhere in the distance. 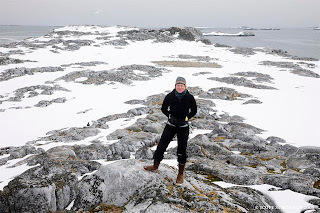 I clamored down and around the crest to look down at cracked ice. With the warm sunny day ahead, these spires and meringues will be moving and slumping all day. Standing there in the sun, I thought about the new day here and the new day in America. I submitted my vote by fax a week ago but today I wish I were back in the US. I'll miss the excitement and the hustle and bustle. To everyone back there, Happy Election Day ! We'll be tuned in to CNN tonight. (Also, I extend big apologies for the lack of posts in the last two weeks. I was fighting technical difficulties here and a general lack of time. But now everything is sorted out again and I'll be making up for lost time with a number of updates this week, so keep checking back). Nearby Torgerson Island has become a very busy place. 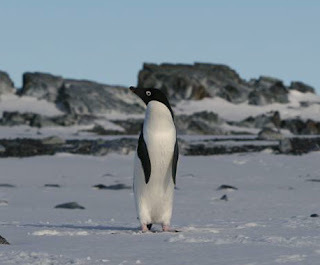 The Adelie penguins have arrived to their rookery. Over the last weeks we have seen first two or three birds, then a few more and now, in these lengthening spring days, the whole population has come suddenly come ashore. 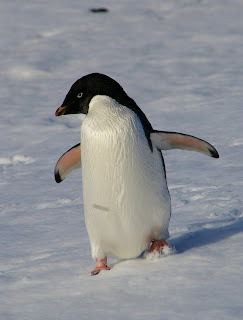 Adelies are beautiful, about 30 inches tall, and more playful than the other penguins in the area. Their colonies are raucous places full of their loud braying calls and flipper waving. The staff down here refers to them as being the "three years old of the penguin world". The males, about 300 of them, arrived first. 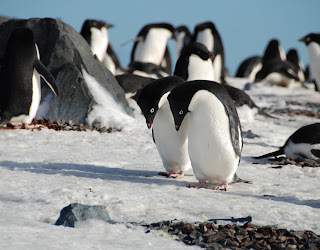 This is a pretty small colony; in comparison, some colonies in the Ross Sea reguion support half a million penguins. 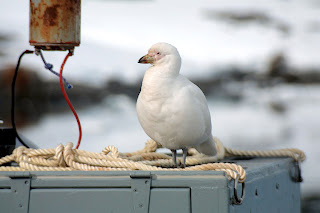 These birds have spent the winter out on the sea ice, which is warmer than the land, and are coming back to their ancestral colony to breed and raise young. Their primary danger through the winter has been the leopard seal which can catch them as they fish for krill in the water or explode up through thin ice to nab them. 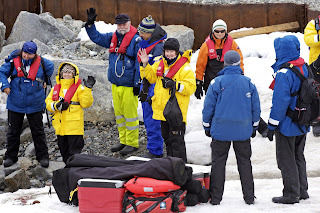 After living though the dark winter and successfully avoiding the leopard seals, they have swum, walked and tobagganed 20 miles or more to get here. A day after the males arrived, the females came ashore, swelling the population to about 600 birds. 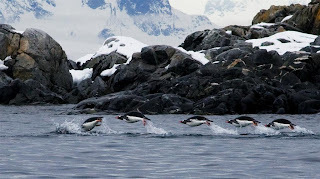 Penguins are mostly monogamous, forming partnerships that last many seasons and so, within minutes of coming ashore, most of the females recognized and reunited with their mates from last year. Nonetheless, for those birds whose partners did not make it back to the rookery, or who have not reunited with their mate, there will be fierce breeding competition over the next few weeks. Watching them on Torgerson, we saw that they had started collecting pebbles for their nests, probably choosing the same spots in the rookery that they had built in last year. In Adelies, like most penguins, the males start the nests first, and then, once they have attracted a mate, or their mate has joined them, the couple will work together to collect and pile up the small stones. Once their nests are built, the females will lay two (or rarely three) eggs which the couple will take turns incubating. Field biologists are arriving on the next boat and they will have the pleasure of monitoring this colonythroughout the spring as the young hatch and are raised. I'll keep you posted !